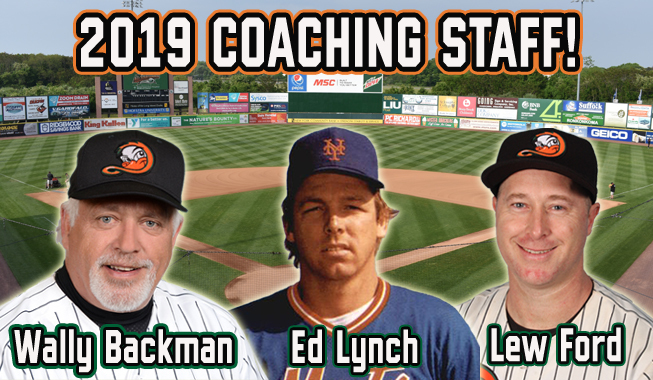 (Central Islip, N.Y., Jan. 14, 2019) – The Long Island Ducks today announced the team’s coaching staff for the 2019 season. In addition to Wally Backman, who was named the sixth Field Manager in Ducks history this past November, the staff features newcomer Ed Lynch as Pitching Coach and returner Lew Ford as Hitting Coach. Lynch is reunited with Backman after the two spent seven seasons as teammates with the New York Mets. The pair were both a part of the club’s 1986 World Series Championship, with Lynch then going on to spend parts of two seasons with the Chicago Cubs. The Brooklyn native served as both a starting pitcher and reliever, appearing in 248 career MLB games (119 starts) and compiling a 4.00 ERA, eight complete games, eight saves and 396 strikeouts. He was originally selected by the Texas Rangers in the 22nd round of the 1977 amateur draft. Ford is set to begin his 10th season as a member of the Ducks and sixth in a player/coach role, having spent two years as Hitting Coach (2014, 2018) and three as Bench Coach (2015-17). The outfielder/designated hitter is the franchise’s all-time leading hitter (minimum 500 at bats) with a .322 batting average. He has played 675 regular season games with the Flock, totaling 71 home runs, 413 RBIs, 440 runs scored, 186 doubles and 245 walks. In addition, the Central Islip resident has appeared in 42 playoff games with Long Island, registering a .269 batting average, four homers, 21 RBIs, 18 runs and 47 hits. The 42-year-old has been selected to play in three Atlantic League All-Star Games while with the Ducks (2014, 2015, 2018). In 2014, he became the second player in franchise history to be named Atlantic League Player of the Year (Ray Navarrete, 2009) after breaking the league’s single-season records for hits (189) and games played (140). Ford has appeared in five Atlantic League Championship Series with the Ducks, including the Championship-winning club in 2013, and has been selected to the Atlantic League's Post-Season All-Star Team twice (2014, 2018). After spending five seasons in the Major Leagues with the Minnesota Twins (2003-07), the Texas native returned to the Major Leagues in 2012 as a member of the Baltimore Orioles after beginning the season with the Ducks.